DAKAR, Senegal — Babacar Ndiaye, 12, doesn’t know Babe Ruth from Bryce Harper. 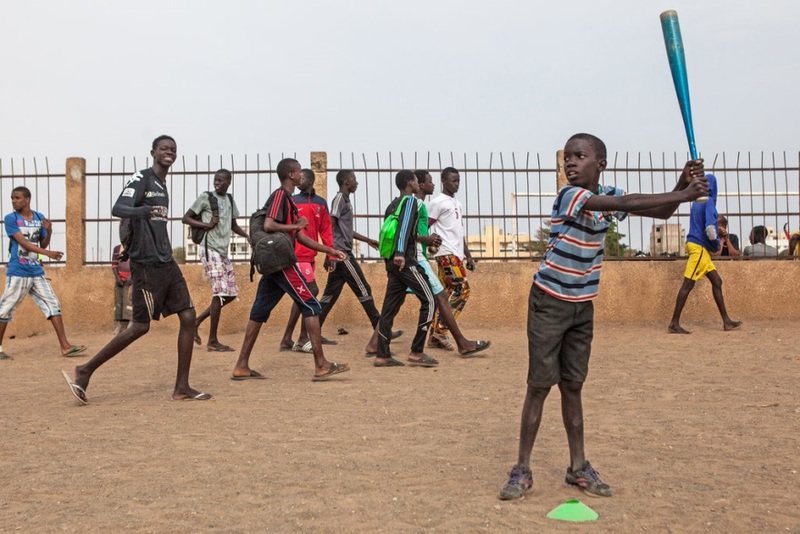 The boy’s favorite baseball player is Ryoma Ogawa, who teaches Senegalese children to catch, throw, field and hit. Baseball is called America’s pastime, but Japan has been cultivating the sport in soccer-crazed Africa for years. Ogawa, 24, is the latest in a long line of Japanese baseball missionaries. They have helped create leagues in Burkina Faso and Tanzania, and the Japanese government paid for new fields in Ghana and Uganda. African coaches and top players visit Japan for training. A few Africans have earned spots on teams in Japan’s independent leagues. Volunteers are sent around the world by the Japan International Cooperation Agency, or JICA, which runs a program similar to the Peace Corps. They say baseball, which is one of Japan’s most-loved sports, is rewarding beyond the field. Ogawa’s weeknight practices are held on a sandlot next to a military base in Dakar’s Ouakam neighborhood. Volunteers and local baseball associations are often on their own because there is little government support. There is no grass and no pitcher’s mound. Players wear jeans, sweatpants or shorts. A big tree sits in left center field, and aircraft engines hum beyond the concrete wall in deep center. The soccer game behind home plate sometimes spills over. During one informal game, a tall boy in yellow rounded third base, pushed aside his slower teammate, and scored ahead of him, an act that would be normal for taxis on Dakar’s hectic roads, but against the rules in baseball. Along with smiles, there is discipline. The boys must retrieve their errant throws. Before each practice, they remove rocks and trash from the field. “If you don’t pick up, you can’t play,” said Mamadou Bassirou, 13. At times, it’s a hot mess of linguistic and cultural misunderstandings. Ogawa speaks some French, but the players prefer Wolof, a local language. He calls out “strike one,” “strike two,” in accented English, and the boys mimic him. They ask him if Japan is the same as China, and if everyone knows karate. Babacar, who has never heard of Miami Marlins outfielder Ichiro Suzuki, either, has barely mastered throwing and catching, yet patriotically discusses his potential as a future professional. Ogawa and another volunteer in a different city instruct a total of 50 children. Since 1970, more than 235 baseball volunteers and 54 softball coaches have been sent abroad, according to JICA statistics. Six baseball instructors are working in four African countries: Uganda, Zimbabwe, Ghana and Senegal. There are currently no JICA softball volunteers in Africa. Frimpong was an outfielder on Ghana’s national team in the 1990s, when he lobbied his government to appoint Shinya Tomonari as the team’s manager. Tomonari was working for JICA in Ghana at the time. Tomonari later created the Association for Friends of African Baseball, which has raised more than $200,000 in the past 13 years to help teams pay for travel costs and equipment. More recently, Tomonari built a league from scratch in Tanzania and managed the country’s under-18 national squad. He returned to Japan in 2015. “There is no culture of baseball on this continent,” Tomonari said. “Many talented players play not baseball,” but soccer. Access to equipment is a major obstacle. Donations from the United States, Japan or elsewhere sometimes sit idle in African ports, because of bureaucratic issues. Security is another problem. Chiba, the Dakar coordinator, said JICA decided to not replace its departing volunteers in Burkina Faso after a terrorist attack in January at a hotel and cafe in Ouagadougou, the country’s capital, left 30 people dead. Tokyo will host the Summer Games in 2020, and Japan plans to increase its global sports initiatives leading up to the Games. The International Olympic Committee will decide this summer whether to return baseball and softball, which last appeared in the 2008 Games, to the Olympic roster for 2020. Supporters say an Olympic return would result in financial support at a local level. South Africa is considered to have Africa’s best baseball program — its baseball team has played in the Olympics and the World Baseball Classic, and a handful of players have played in the minor leagues — and is the site of Major League Baseball’s annual “African Elite” camp. Among other countries, Uganda is widely considered the next baseball hot spot on the continent. A Ugandan team in 2012 became the first from Africa to compete in the Little League World Series, and Richard Stanley, a part-owner of the Double-A Trenton Thunder, built an academy there focusing on baseball and softball.